This is the third in a series of books on the subject of ancient immigrants into the Americas. 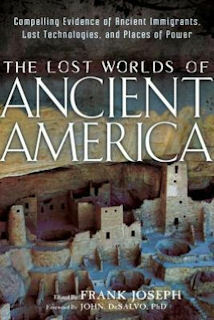 The book consists of a collection of essays from Ancient American magazine, written by authors who argue that the Americas were visited by colonists from west and east long before Columbus. This is an argument that is hotly contested by academic archaeologists, except for perhaps the two strongest cases of pre-Columbian colonies: the Norse colony at the L'Anse aux Meadows site on the eastern Canadian seaboard, and the Valdivia site on the Pacific coast of Ecuador, which may have hosted colonists of Japanese origins from as early as 3000BC. The archaeological evidence for these two instances is strongly suggestive of cultural diffusion. But there is also a host of other anomalies suggestive of other visitors to the Americas - Romans, Phoenicians, Celts, Cretans, Minoans and ancient Egyptians. And, even further along the spectrum of speculation, other researchers argue for a link with the mythical Atlantis. Researcher and author Frank Joseph acts as editor for this compilation, and draws from a very broad church of opinion, as well as contributing several excellent essays himself. Many researchers point to similarities between South American ancient architecture with similar structures elsewhere (e.g. Hill Forts in Indiana bearing a striking resemblance to those in Wales, or the striking similarity between stone towers in Japan and Ecuador). Others speculate that the Americas were the locations for various mythical lands described by Romans ("Cattigara"), Greeks, Egyptians ("Punt") etc. The indigenous populations of the Americas have myths aplenty telling of visitors to their shores, providing knowledge and civilisation. There's a refusal among academics to accept complexity - that the ancient world was a more varied - and rather more wonderful - place than many historians believe it to have been. The book cites several occasions when intrepid modern researchers arguing for trans-oceanic exploration in ancient times have put their money where their mouths are and built reproductions of ancient vessels, and then sailed vast distances in them successfully. It proves the point nicely. But why would the ancients have tried it? To explore - a dream sadly lost to our modern times. Not all people where afraid of falling of the end of the world. Certainly, there was enough persecution going on in the bad old days to provide sufficient motivation for groups of people to set sail from familiar shores in search of a distant, fabled utopia. Many didn't make it, but some seem to have, and left their mark across the Americas, however short-lived. Their story is surely historically important enough for archaeologists to get interested in when their alleged artefacts turn up. Sadly, this is rarely the case. Overall, this book argues its case well, albeit in a somewhat one-eyed sort of way. If I had been editor I would have cropped out some of the shorter, more fantastical articles, which diminish the book's broader credibility. I would also have included more in the way of images and diagrams - there are many occasions when even the best written description of an artefact or building falls short. My favourite chapter was Bruce Schofield's compelling essay on Ecuador. Additionally, in Frank Joseph's excellent essay "Prehistoric Aviators of the Andes", I was fascinated to learn about the first man to fly; Bartolomeu de Gusmao, dubbed La Voador in 1709 by the amazed court of John V, the King of Portugal. Gusmao, whose immense achievement is not properly credited in the history books, may have learned his secrets of balloon flight from the construction of ceremonial aerostats by Brazilian natives. So, an excellent read, full of remarkable evidence to ponder upon. If I had a criticism of this genre of research it is that, generally, it is itself culturally biased towards visitors from the Old World. Perhaps earlier volumes have already dealt with immigrants who made their way across the Pacific from Asia, bringing civilisation to Mesoamerica and the Andes. But I suspect this area of thought is less prevalent than the research which tries to discover links to the Mediterranean cultures that gave birth to Western civilisation. That desire to link ancient America directly to the Old World may feed a deep need in American researchers - one that they should be wary of as they consider cultural diffusion across the globe in ancient times. Subtitled "Compelling Evidence of Ancient Immigrants, Lost Technologies, and Places of Power"